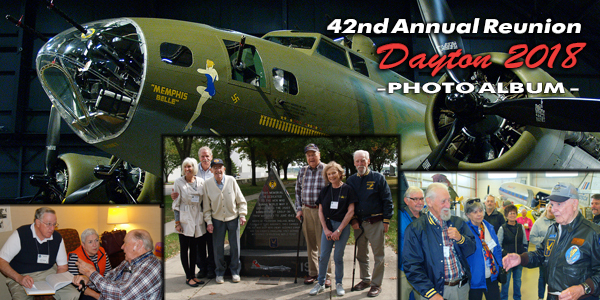 The 351st Bomb Group Association held its 42nd Annual Reunion in Dayton. Activities included visits to the National Museum of the US Air Force and the Champaign Aviation Museum, and more. Our photo album shares some memories of the reunion's events and participants. Details for our 2019 reunion will be announced in the Polebrook Post. For many years, Ken Harbour was the Group Historian. He co-authored "The 351st Bomb Group in World War II." with Peter Harris. Ken also created a web site that contains additional information and photographs. The book was expanded and reprinted in 2008 as "The 351st Bomb Group - The Duty to Remember"; copies are available for purchase. Ken passed away in 2010. We are grateful for all that he has done for our group and for his friendship. Our Crew Member Database allows you to search the load list records to find out what missions the men and aircraft flew on. Additional information on 351st Missions is available in our Missions Section. A Personnel Search page provides information on individuals (including the ground crews and support unit personnel) stationed at Polebrook. Our database is a work in progress and is constantly being updated. The 351st BG PX features shirts, hats, unit/squadron patches and books. Most of the books are authored by 351st veterans who share accounts of life at Polebrook airfield and their wartime experiences. Proceeds benefit the 351st Bomb Group Memorial Association. The 351st Bomb Group Association is a nonprofit Public Charity 501(c)(3). Please contact us for membership information. Donations may be sent to 351st Bomb Group Association, Attn: Bruce Nocera, PO Box 6391, Astoria, NY 11106. Copyright 2019 351st Bomb Group Assoc.